You are currently browsing the tag archive for the ‘Anaheim Ducks’ tag. I have to accept that the Ducks can’t win every night; for a while they looked unbeatable at home. A team that was rough to play against in their own building has just suffered its fourth loss in five games at the Honda Center. While we aren’t talking about a total collapse (the Anaheim Ducks still hold down first place in the NHL!!! ), it’s something I’ve grown unfamiliar with, but luckily, I was able to wash down that sinking feeling of losing to Columbus with one of the most interesting beers of my life. 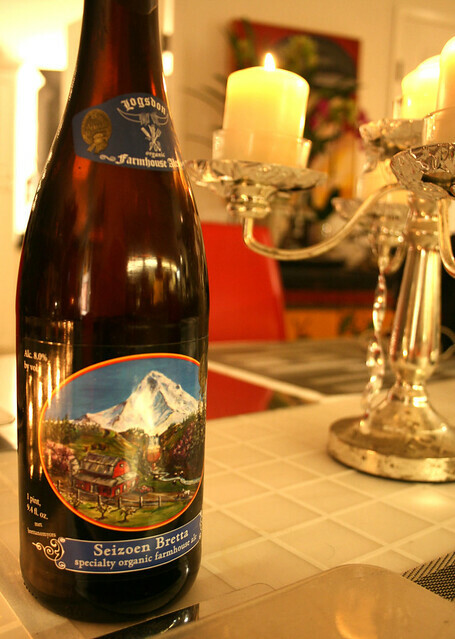 I generally dedicate these posts to extolling wines, but Logsdon’s Seizoen Bretta reminded me that beer could also be quite venerable. 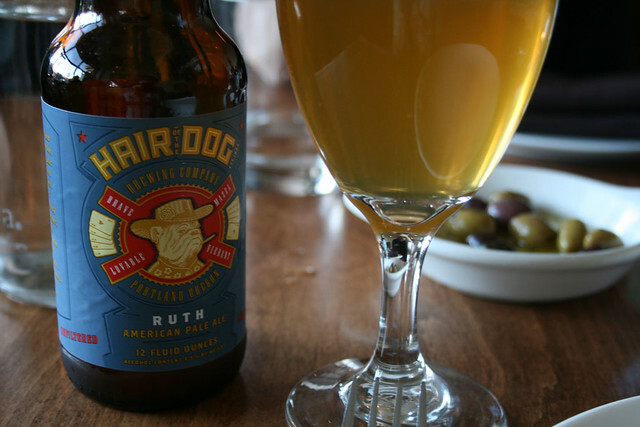 The Hood River, Oregon natives craft serious Farmhouse Ales, working with organic ingredients and foundation native yeasts to produce daedal ales. Monday night the Ducks lethargic play took a backseat to a rustic and inspiring seven-fifty of Seizoen. Unfiltered and hazy, showing an incandescent orange in the glass with animated carbonation that brought out an intense aroma of pineapple juice, bandage (caused by the Brettanoymces and the namesake of the beer), hay and citrus blossom. It tasted of bitter lemon and apple cider, and even apricot appeared with overtones of leather and earthier flavors sounding deeply. It was balanced, complex and possessed excellent acidity to leave a refreshing finish. I was in a state of beer awe. Dismayed by watching the Ducks drop another game, but captivated by the waves of flavor and the strong finish of Seizoen, here’s hoping for a better days to come for my favorite hockey team—I cannot ask for any more of Logsdon’s outstanding Seizoen Bretta ale. It had been a while since I last had a burger, tiptoeing around my favorite comfort food in hopes of reinvigorating the palate. In lieu of the patty I was on an Asian binge, I devoured lunch at Lukshon, which was a catalyst for delving further into a Far East bender. Undocumented dinners at A-Frame and Nong La would eventually take me full circle though, as I went fifth wheel to finally order a highly touted burger at the Westside Tavern. Beside the Landmark Theaters, the Westside Tavern is a contemporary space that offers fine-tuned American fare complimented by a deep beverage program. Reminiscent of Hillstone’s, but not a chain, Westside Tavern relishes its role of convenient date spot for the pre-movie crowd or can act as a beautiful finishing touch to an evening. With a pair of married couples, we grabbed a booth, catching the last two periods (plus some bonus hockey) of the Ducks vs. Kings game over cocktails and burgers. Well into my bourbon drink and at about the halfway point of the game, the food appeared. From the lens of my iPhone, I best documented the rotund grub, capturing a melted layer of Tillamook Cheddar dominating the landscape; the finely ground, hand-packed patty was completely obscured, supported by a brioche bun with a few leaves of arugula lending color. However, it is what you couldn’t see that seemed to bring the burger down a notch; a mess of caramelized onions and the garlic aioli that were very present on the first bite. 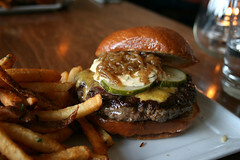 The meat and cheese combo were sterling, but the proportion of caramelized onions seemed to drown out the sandwich. I was essentially eating two things: French Onion Soup from Mimi’s Café and a gourmet cheeseburger on the side. The sea-salt fries were splendid though, helping me reset after a few bites. 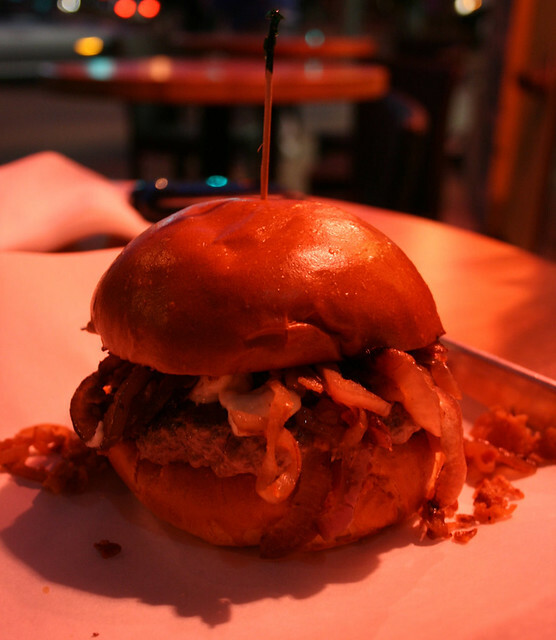 Apart from the palate confusion, the burger showed some good qualities like being perfectly cooked and seasoned well when those bites weren’t masked by the overpowering combination of garlic spread and sweet onions. While I didn’t agree with the acclaimed status of Westside Tavern’s cheeseburger, the restaurant showed that they were more than just a catchall for those on a date—definitely a good spot for a drink. My charitable mood may have had something to do with the Ducks downing the Kings in an exciting shootout, yet I wouldn’t rule out a repeat visit, even if the food failed to capture my heart, or stomach, the way Lukshon did. Back to the drawing board. With Halloween behind me and a miserable Ducks road trip safely in the rearview mirror I cannot help but start looking forward to greater food-centric holidays and the prospect of watching my favorite hockey team string together a few wins. I am certain that good food and wines to match are going to propel me through my countdown as the year winds down, and as far as the Ducks—no promises. With all the looking ahead though, it would be hard for me to forget the festive party I attended (at my apartment) a few Fridays back, and the three wines I uncorked for the spook soiree. My roommate has always been a fervent calendar observer (he maintains that it is only at Halloween and Christmas but, I must attest, his adherence and excitement are constant), planning ahead, decorating accordingly and throwing a dedicated bash. When I came home, late from work, to his party, this was no exception; everyone clad in costume from Occupy Wall Streeters to Where’s Waldo’ers. Myself, I was a stranger in my own home but I was armed with the treasures of a wine salesman, plentiful samples for just such an occasion. 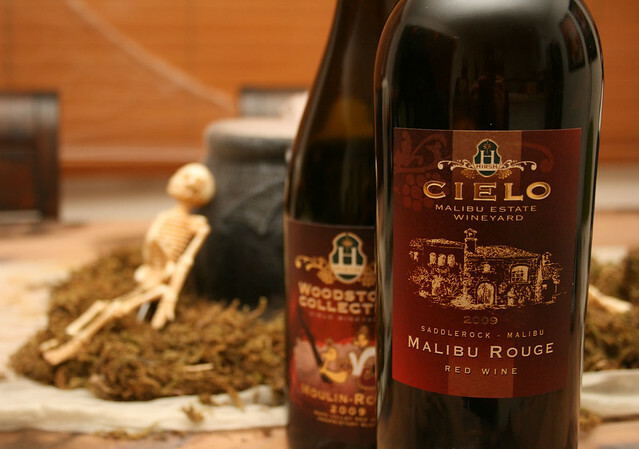 In my possession were the wines of a Malibu Winery—Cielo Farms—from the Saddle Rock AVA, wines that I was familiar with only by name. I was excited at the promise of something great. A believer in local. As the night began, a co-worker joined me and I promptly uncorked the 2009 Malibu Rouge (#151) and poured generous measures of concentrated vino into our beakers. Relying only on Halloween lights, it was difficult to discern the hue of the wine, so, we made use of our other faculties to assess its quality. 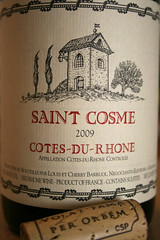 The young wine had a bouquet of luscious dark fruits and little else. The Malibu Rouge was soft (smooth tannins) and full-bodied with extraordinary amount of fresh fruit that spilled over the tongue—very rich. It was a hedonist’s delight. Getting into the spirit of things I opened another heavy bottle from Cielo Farms, with fruit sourced from Napa Valley under the moniker Moulin-Rouge (#150). Without knowing what fruit constituted the blend it would be hard to tell what exactly I was drinking, or the order of the bottles, but I was happy with the results. The Moulin Rouge had a bit more going on on the nose and in the mouth. Ripe fruit, coffee and some smoke exposing itself, with refined tannins, a little heat (from alcohol) but everything seemed to be in proportion. I took a required break, the alcohol on both Malibu wines tipped over 15%, and its effects were beginning to show—we were drinking, not just tasting. Enjoying the party and some of the spread—compliments of my roommate’s girlfriend—I ate a fair amount of the savory items that were laid out on the table. An hour elapsed and I had aired out. The group was on the verge of a séance and I thought it a good time for a bubble break. A quick reprieve before things got creepy. 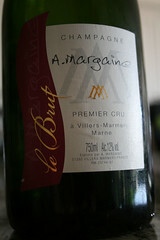 The NV A. Margaine Champagne (#149) was the pinnacle of the night. The Premier Cru Champagne yielded decidedly nutty and toasty notes. The sparkling wine had a terrific mousse as I poured at an angle into my makeshift flute. I shared this wine with everyone who wanted some; there were a few takers but most people passed—a real shame. I take every moment I can to enlighten others on the prospect of bubbles outside the sphere of influence cast by Veuve Clicqout. The A. Margaine was delicate and racy with bright acidity and soft almond and golden apple flavors that sounded long after the last sips of the Grower Champagne. The séance-insistent crowd subsided and the talk turned mundane. After a serious amount of wine I was ready to take things easy and enjoy the remainder of the shindig before retiring. I knew full-well the quality of the Champagne I had selected and was happy to create a few converts along the way, but the more surprising were the samples from Cielo Farms. The genuinely local wines were a hit, with an uncanny fruit-forwardness that made them dangerously easy drinking. I am still looking ahead to brighter days as a Ducks fan but I have to say that Halloween is growing on me. The NHL season is underway and the Ducks have started the season with an impressive record, keeping me glued to the TV and giving me another event to cover during a busy campaign (forgive me, I have been watching a lot of re-runs of The West Wing) of blogging. As I get ready to take in the season, parsing my time between blogs, actually playing hockey and wine tastings, I can only hope this is a big season for the Ducks as it will manifest nicely into many celebratory posts. Another thing that my team’s season means is that there will be less time to enjoy films, a past-time for me, as I always try to catch up over the season break, enjoying as many “classics” as I can. The difference this year has been that I introduced wine to the movie-watching process, feeding two birds from one perch, so to speak. Far and away the zenith of my summer time movie watching came when I had a miniature Paul Newman fest. I had never seen Cool Hand Luke before and that was a huge priority over the break—to enjoy cinematic history, line after famous line—coupling the experience with two different bottles of Pinot Noir. I had my glassware ready with two glasses of similarly hued vino so that there would be little pouring distraction during the picture. 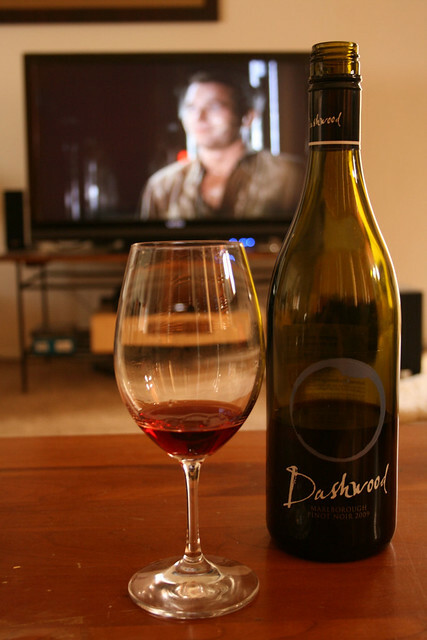 While mentally tracking the film, paying attention to the scoring, actors in their youth/prime and the recognizable dialogue, I would casually sip on my first glass of 2009 Dashwood Pinot Noir (#160) from New Zealand. 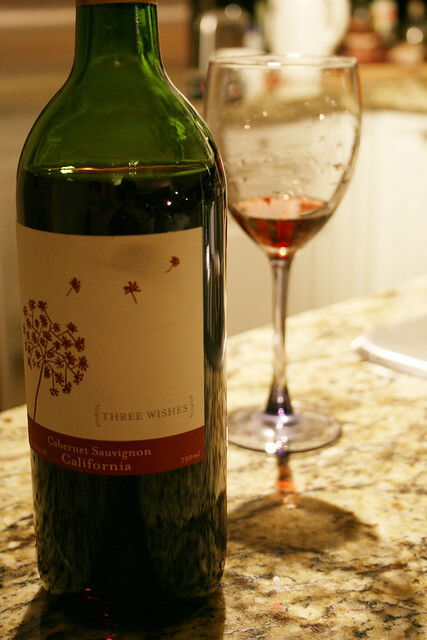 The fruit-forward red was packed with light tannins that made it very easy drinking. There was little to pay attention to in the wine, just never-ending fruit with moderate acidity that kept the Pinot from being out of shape. It paired well with the film, from the opening scene of Paul Newman lopping the heads off of innocent municipal property—parking-meters—through his tender banjo playing on learning of his mother’s death; the wine deferred to the movie, content to take the backseat. The A-Z Pinot Noir from Oregon (#159) was a little bit more distracting, the flavors changed, noticeably, shifting from ripe cherry found in Pinot from New Zealand to earth and cranberry. The wine was replete with mouth-puckering acidity and lightly drying tannins. During the film, the Pinot was noisier—in an inaudible sort of way—not as eager to let the spotlight fade, nor share it with the movie. It had structure that made me pay attention to it, and thus, it was not a good candidate for movie viewing (viewing this movie), though its flavors meshed better with the tragic ending befalling Luke. 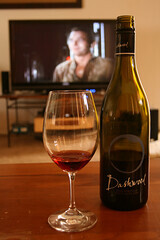 While I watched other movies in my downtime, Cool Hand Luke was definitely the most memorable, not so much for the wines—though those showed well—but for the quality of the film. Trading movie time for the coolest game on earth—hockey—is not so difficult; going forward I will trudge happily into Duck-mode and, hopefully, be afforded many opportunities to drink Champagne. Let’s Go Ducks! 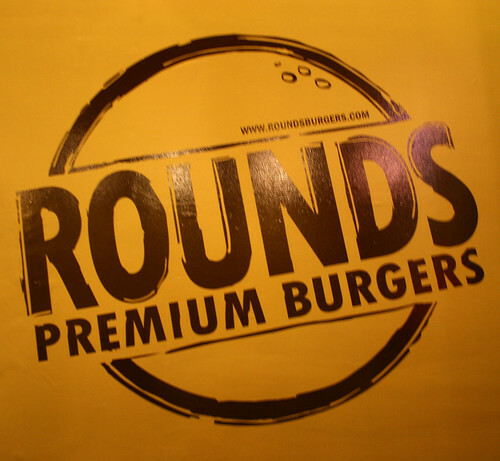 Friday night burgers have been a sporadic tradition this year, a more commonly practiced ritual in 2010, but never the one to give up on good times, I was set on visiting a burger spot that was affordable and was recently reviewed with good marks. 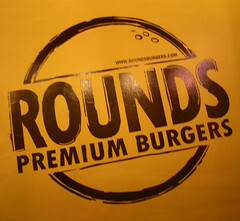 I invited two friends to accompany me to West Hollywood to try a spot that fit the criteria—Rounds Premium Burgers—on Santa Monica Boulevard. I would be pairing a bottle of 2009 St. Cosme Côtes du Rhône (# 317 on the year) with their hamburger and hopefully catching the Ducks must win game against the LA Kings. We met sharply at 7:30, still trying to catch the fleeting daylight—to aid in all aspects of photography and because I don’t have an adequate flash—and be early enough to continue the remainder of the night in downtown. A pregnant agenda. Across from the Sherriff station of West Los Angeles sits Rounds, a newcomer to the gourmet burger craze that happens to capitalize on the enormous amount of foot traffic that the area receives. 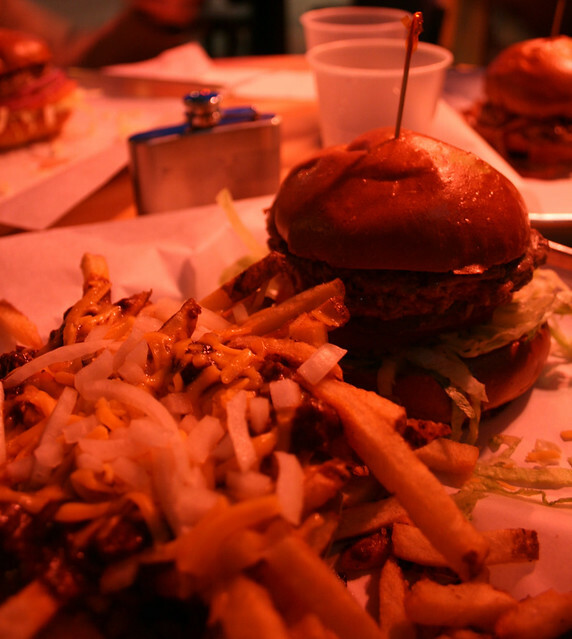 When our group arrived, we narrowly averted the rush and were able to order three burgers without waiting. We took our seats and discussed music, food, wine and civil engineering. Literature and film were on the horizon but were interrupted by the burgers, a seemingly short wait for my original burger and chili fries to be brought to the table, along with the other styles of burger to be caddied over to our group. We took some ceremonial photos, again trying to catching the waning daylight (apologies), divvied up the contents of the flask—eyeing the Sherriff’s station as we poured—and dug in. The presentation was casual; I could see these creations being served at a bar, packed with a fluffy and obtuse bun encasing the usual suspects: a hefty patty atop lettuce, tomato, pickles, a daub (as opposed to swimming in a thousand island spread) and rings of red onion. One of my buddies ordered the homage to Father’s office—at a fraction of the price—aptly dubbed The Office burger and found it to be exemplary. 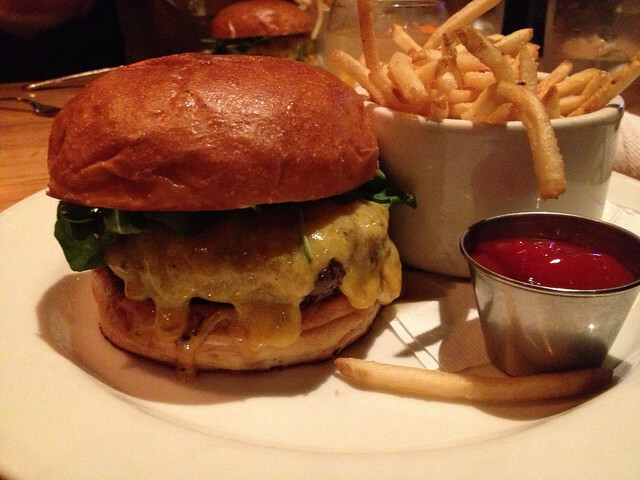 As was mine; I thought the meat—which when that charitable, could break the burger—was cooked to a perfect medium. It was not skimpy and showcased a classic California style. 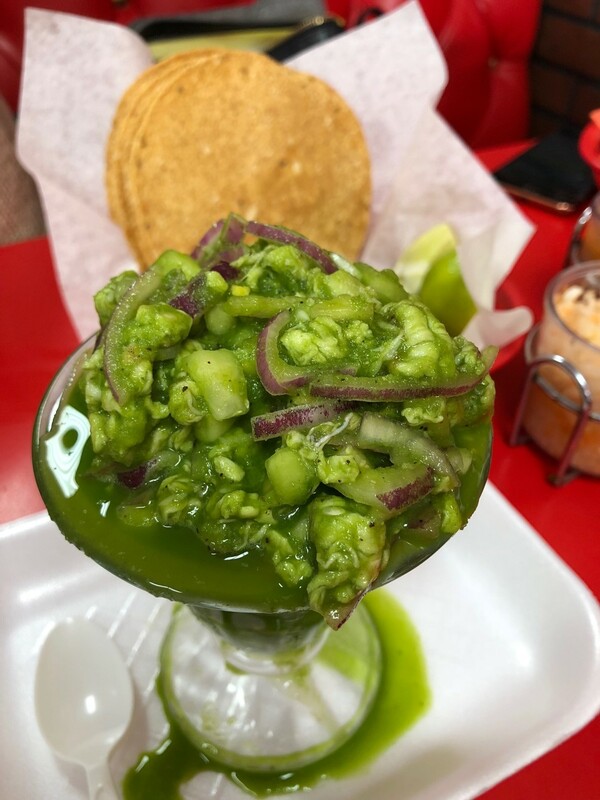 The only thing I missed was the pickles and yellow peppers (chiles picantes) that are a staple of my favorite burger joints. 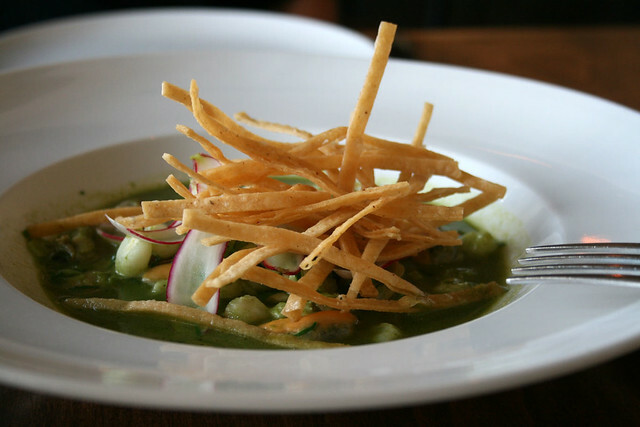 The latter can burn the palate in high doses, so best to be indulged in smaller quantities. The St. Cosme’s peppery profile complimented the burgers well; the alcohol was in proportion, lending the solid body to carry the burger and a good jolt of acidity to ready our mouths for the next bite. 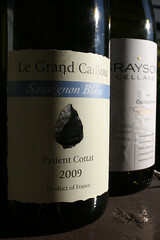 The structure of the wine really highlighted the food; it was kismet that they were served together. As for sides… I am not really a fan; I often feel that they serve as a distraction from the show, not really a true sidekick. However, each new place I explore I feel obligated to try something else on the menu—to test the people making the food. The chili fries were surprisingly good, with copious amounts of burger meat and raw white onion to pack each bite with flavor—they were reminiscent of Ruby’s chili fries, only difference being, Round’s fries were cut thicker. 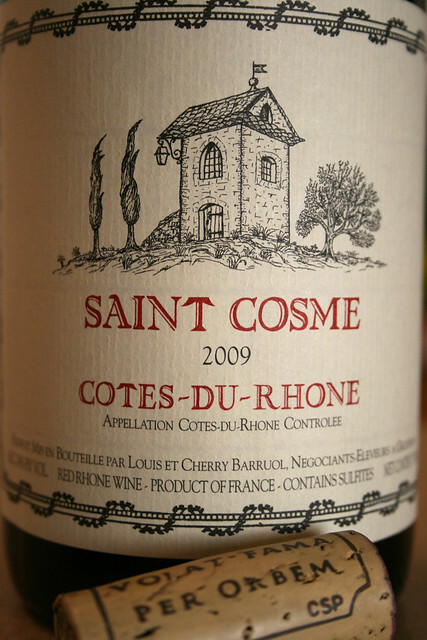 I am not one to discount value but I am certainly not drawn to a place because it is cheap either but I would highly recommend a visit to Round’s Premium Burgers for excellent quality tailored to reasonable prices and if you are craving some wine look no further than the 09 St. Cosme Côtes-du-Rhône. I think the thing that made this night truly incredible, was catching the last period of the Ducks game, a victory against the Kings (the first of two consecutive wins against the cross-town rivals) and watching them lock up a spot in the playoffs. Friends, burgers ‘n wine and a Ducks win, no better way to spend a Friday night. A humbling event transpired Tuesday, to begin my class, when I was quizzed on all things Burgundy, from the Côte d’Or to Beaune and all the history in between to grace the legendary area of France. 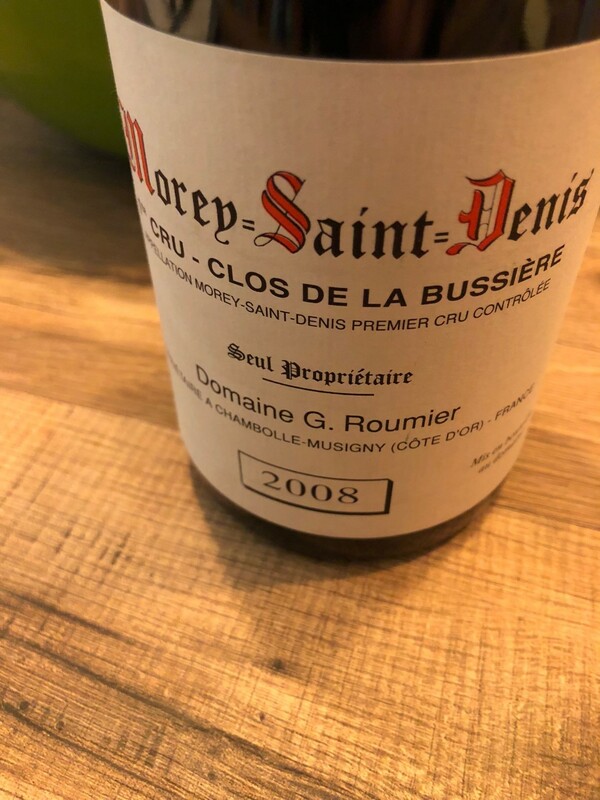 I received such a dismal grade, worse than expected, from shirking my studying, that I resolved to not have the same thing happen again when it came to the wines of Rhône or my Bordeaux exam the following day. One too many Ducks games perhaps, or too much time spent listening to these guys. 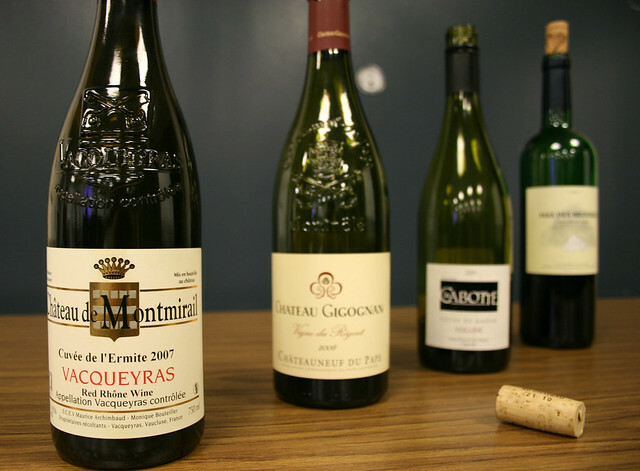 The Rhône produces meaty and savory reds, laced with pepper and dripping with bacon fat (a man’s man kind of wine) all courtesy of Syrah, Grenache and Mourvèdre along with a handful of other grapes that happen along the Southeastern French terrain. Another reason why I was dialed into Tuesday’s subject (Rhône wines) was their ability to pair with burgers—lest that not be forgotten! Divided by latitude, the North inherits a Continental climate while the South roasts in warmer Mediterranean environs. The Southern region lays claim to Châteauneuf du Pape—singularly the most famous of the Southern appellations—and within one area, outproduces the total production amount of all the Northern Rhone bottlings. 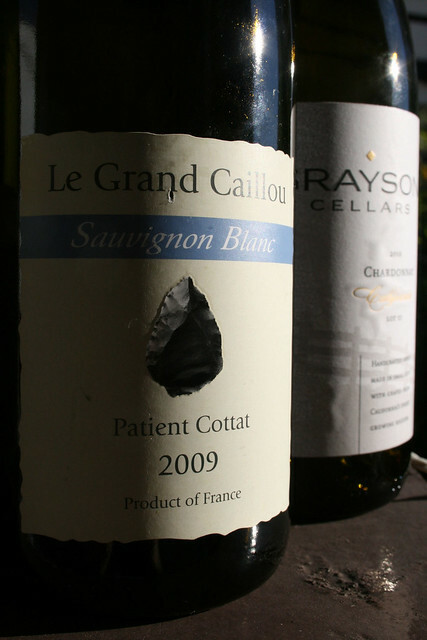 In the North there are some renowned appellations of white and red wines alike, including Château-Grillet, Hermitage, Cornas, Condrieu and others. Syrah is the only red grape permitted in these wines, however Viognier—a white varietal—can be blended in. These respective regions provide some marked differences in flavor profiles and were apparent when we tasted through both regions. The wines of the Rhône matched their descriptions, the Northern batch were redolent of green olives, charcuterie, smoke and fresh ground pepper while the Southern band—most notably from Vacqueryas, surprisingly not Châteauneuf du pape—screamed “I will light you on fire” with overripe fruit and spiking alcohol, showing their warmer milieu. Aside from the beautifully embossed bottle of Chateauneuf-du-Pape, its papal insignia beveled in the glass, there was little else capturing my attention. 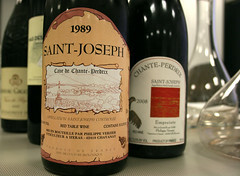 The vertical tasting of Saint-Joseph wines were the other highlight, a difference of 19 years between the two and still some elegance retained in a wine while the rest of the collection showed somewhat blasé. Maybe it was the quiz that had dampened my taste buds but the wines were just mediocre. Excuses aside, I rebounded quickly from the embarrassing quiz; the next day I aced my Bordeaux final and hope to stay trained on the Rhône varietals and all else that crosses my path. Oh, and as for that Road-To-500, only 427 left on the year! Overwhelming. A summation of my experiences in one word, after I attended the Union des Grand Cru de Bordeaux event this past Saturday at Barker Hangar in Santa Monica. Last Saturday was also a very special Ducks hockey game; the first time that Saku Koivu would return to Montreal, as an opponent, after captaining the Canadiens for nine seasons. The stars were aligning. 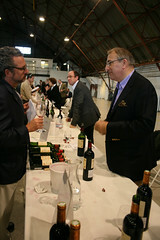 Wally’s—a champion of Bordeaux wines—sponsored the event, making their sponsored presence felt at every turn with offers to buy Bordeaux. The tasting featured some of the legendary Châteaux, showcasing their wines of the 2008 vintage. The event is held annually and allows the consumers/professionals to taste through an esteemed lineup of producers’ efforts that might be hard to replicate. 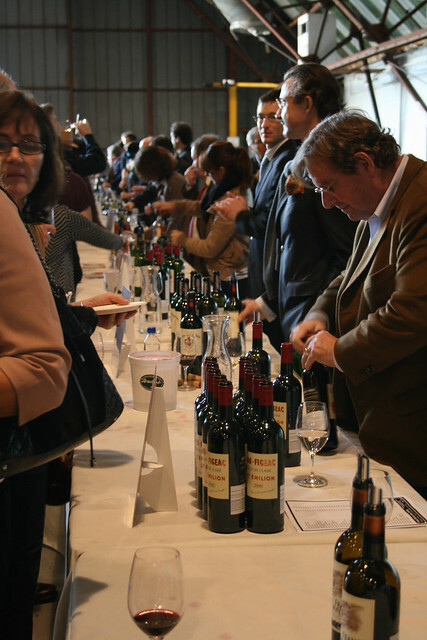 It also presents an opportunity to have conversations with some of the Château owners, along with other knowledgeable representatives of these famous estates. It was my first time at an event of such magnitude (and caliber), having been to tastings more intimate before. This was a classier free-for-all—a run on all precious vin de Bordeaux. It was not what I was expecting. I met up with my professor at the beginning of the event, before establishing a tasting order, heeding her advice on sampling through the wines and diligence about spitting, no matter how many bodies crowded me out. She also told me break frequently, for my palate’s sake, and to change up the sampling by tasting some of the dry white wines that were being served, to reinvigorate the taste buds. The hangar was brimming with people on both sides—bees buzzing vibrantly around the comb—and I decided to break right and taste the wines of Paulliac first. The first pours of Bordeaux I really prized. I held on to my stemware to sniff the delicate and amazing perfumes in no rush to taste, but instead to take it easy and keep from being overcome. I tasted too many wines to remember the exact order but the 2008 vintage was showing well with the Cabernet based blends of Paulliac. Tasting myriad wines and scribbling my notes in the books (provided by Wally’s) proved difficult because I had to balance the glassware on some of the booklets, mind my clunky camera and move through the crowds of people to find some elbow-free room. I was able to catch notes of fruit (primarily cherry, blackberries, plum…), tobacco, herbs and sometimes an occasional trip to the kinderboerderij [kin-der-börder-rye]. The tannins inside the mouth ranged from dry and firm to bitter and all were omnipresent. The finish on some of the wines was intense and others were truncated… tasting side-by-side did some favors. 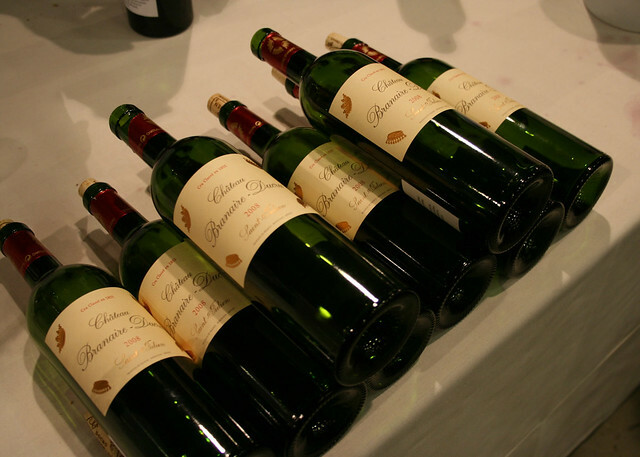 I was really impressed by some of the wines of St. Émilion, especially Château Figeac and Canon-La-Gaffelère, which were really a treat to try—I even contemplated not spitting but remained dutiful and consistent. By the time I made it to Pomerol my phone had alerted me that the Ducks game was underway and at that same time my tongue was beginning to show signs of fatigue. My glass also began to be partial, retaining some of the powerful jam-like odors of all the red fruit blends. I called a timeout and drank some water, swishing aggressively to revive the palate. I decided it was time to engage the white wines of Graves. The first glass of Ch. Smith Haut Lafitte was perfect; it sent an electric pulse down my tongue, resuscitating it with the refreshingly high acidity (higher in contrast to the red Bordeaux). Moving casually down the line of the white wines until my taste buds came to. I then embarked on the wines from Margaux and tasted some wonderful examples from Ch. Lascombes and Ch. Giscours. I continued weaving in and out of the frenetically paced (by this time…buzzed) crowd, pushing through till it was time to taste the dessert wines of Sauternes. Unfortunately though, I was not the only one with that idea. It was suddenly much more aggressive, people snaking others for the last sip of Ch. Guiraud and other honeyed sweet wines. What little I tasted, before I called it quits was spectacular but that crowd turned me off; it was crazy. On the flip side of crowd behavior, the hockey fans of Montreal were giving Saku Koivu a spine-tingling ovation—very rare to see an opposing team’s crowd bestow such an honor on a former player. If only the majority of consumers acted so beautifully (or I had the courage to ask that girl from my class to come with me) this tasting would have been my favorite. 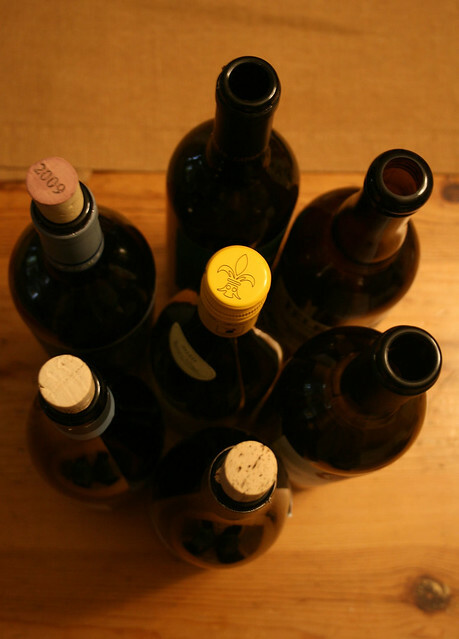 Much like huge music festivals, I prefer smaller concerts and definitely smaller tastings—where a few special wines are sipped with more emphasis, each particular bottle being understood and appreciated or, just hearing one musician that would be worth the price of admission instead of rushing through sets to get to the next artist, sacrificing bands and songs along the way. I feel very lucky to have tried all the Bordeaux that I got around to but will probably have a much different approach for the next major event. I went home, prepared a dry-aged ribeye with chanterelle mushrooms and brussels sprouts (held off on the wine) and caught the tail end of the game; a shootout victory for the Ducks and I was able to witness the other neckhair-raising cheer for Saku as he took to the ice as the second star of the game. Beautiful evening.